A company called Inicons is launching a new 12 inch action figure – of Steve Jobs. Steve Jobs, the co-founder of Apple, died last October after a long battle with pancreatic cancer. 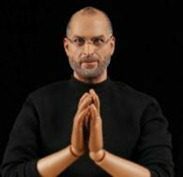 If the images are any indication (and there is a warning on the company’s site saying the appearance of the actual product may vary), the Steve Jobs doll will be incredibly realistic. From the pores and lines on his skin to his stubbly pepper-gray beard. From his wireframe glasses to his New Balance 992 sneakers. There’s even a gold wedding band on his left hand. According to the Daily Mail, Apple is aware of the company’s plans to sell the doll and had not authorized the use of Steve Job’s likeness. It’s unknown what action they may take. Apple did manage to stop the release of a different Steve Jobs doll in 2010. The doll is set for a February release and is priced at $99 plus shipping. The package includes a variety of items, including three pairs of hands, two pairs of glass, a tiny black turtleneck, a pair of tiny blue jeans, and a ‘highly articulated body’. The company’s site, inicons.com, appears to be slammed with traffic today – trying to get to it is difficult, but not impossible, at the time this is being published.